There’s new reporting about anti-LGBTQ hate group leader Tony Perkins’ role in crafting the latest White House policy banning transgender troops from serving in the military -- and that’s only the most recent reminder that we should be very, very worried about the Trump administration’s coziness with anti-LGBTQ hate groups and extremists. Hours after the White House released an updated policy banning transgender service members from serving in the military, Slate’s Mark Joseph Stern reported that “behind the scenes, a ‘panel of experts’” crafted a report justifying the ban. The so-called experts included Perkins, president of anti-LGBTQ hate group the Family Research Council (FRC), and the virulently anti-trans Ryan Anderson from the Heritage Foundation, who wrote an entire book dedicated to discrediting the transgender experience. Stern also reported that Vice President Mike Pence, who has a long history of anti-LGBTQ animosity and is a longtime friend of Perkins’, “played a leading role in the creation of this report.” This is yet another disturbing example of anti-LGBTQ extremists’ influence on White House policy and close relationships with the administration. Just one day before Trump announced the new policy, Tyson Langhofer, director of the Center for Academic Freedom at the anti-LGBTQ hate group Alliance Defending Freedom (ADF), spoke at an official youth outreach event at the White House. During the event, Justice Department Office of Public Affairs Director Sarah Isgur Flores praised ADF as a “great organization” and thanked Langhofer for its work. 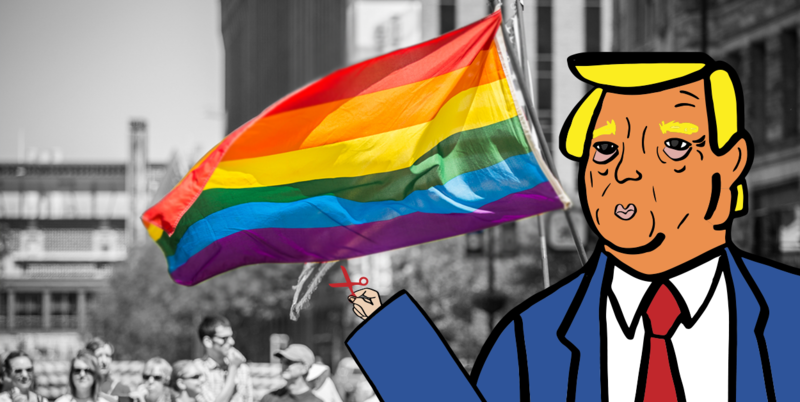 After consulting with ADF, Trump and Attorney General Jeff Sessions released religious exemptions guidance making it easier for individuals and businesses to discriminate against LGBTQ people. The Justice Department issued an unusual brief on behalf of ADF’s client in the Masterpiece Cakeshop v. Colorado Civil Rights Commission Supreme Court court case. ADF is reportedly in “negotiations” with the Trump administration to undo protections for incarcerated transgender people. Perkins has bragged about how many times he has visited the White House. Trump is nominating attorneys with ties to ADF for federal judgeships. Former ADF legal counsel Matt Bowman works in the Health and Human Services Department (HHS), which has been employing more right-wing religious activists and has started a Conscience and Religious Freedom Division that makes it easier for health care providers to deny services to LGBTQ people, among others. Roger Severino, who wrote an anti-trans report with Ryan Anderson at the Heritage Foundation, runs the HHS Office of Civil Rights. Former Family Research Council Chief of Staff Shannon Royce has emerged “as a pivotal player” at HHS as director of its Center for Faith-based and Neighborhood Partnerships. Former ADF Communications Director Kerri Kupec is a Department of Justice spokesperson. ADF client Sara Hellwege spoke at the HHS announcement of its anti-LGBTQ rule granting religious exemptions for health care providers to deny services to LGBTQ people. At least four people who have worked for the Family Research Council were on Trump’s transition team. These groups spent years under the Obama administration pushing anti-LGBTQ policies through municipalities and states and fighting equality in court while also strategizing over how to undo the progress that has happened over the past decade at the national level. Now the current administration is welcoming them to the table and fulfilling their wish lists. Trump made a clear play for these groups and their supporters' votes when he chose Pence as his running mate, and so-called “values voters” like Perkins have repeatedly abandoned their morals to defend Trump -- and reaped the rewards in policy. We are witnessing a massive effort to roll back LGBTQ equality at all levels of government and on nearly every issue affecting the lives and rights of community members, and these groups are at the forefront of it. And there are repercussions outside of the policy realm: Their attacks are creating a more hostile, anti-LGBTQ environment in society at large. For the first time in four years, acceptance of LGBTQ people has decreased, and violence against the community is surging without many Americans even being aware of it. The trans military ban was just the latest win for anti-LGBTQ hate groups. There will certainly be more. If you haven’t been alarmed by this yet, it’s time to be now.